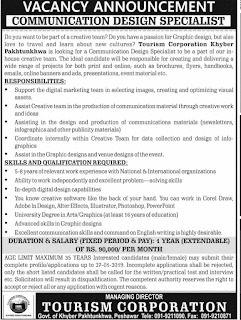 Below are the complete details of the Communication Design Specialist jobs in Tourism Corporation Khyber Pakhtunkhwa in Peshawar. Qualification: Tourism Corporation Peshawar Jobs For Communication Design Specialist must be relevant degree with minimum 5 to 8 year experience in relevant field, its a permanent based jobs, both male & Female can apply for this post the last date of submission application is 27 January 2019. 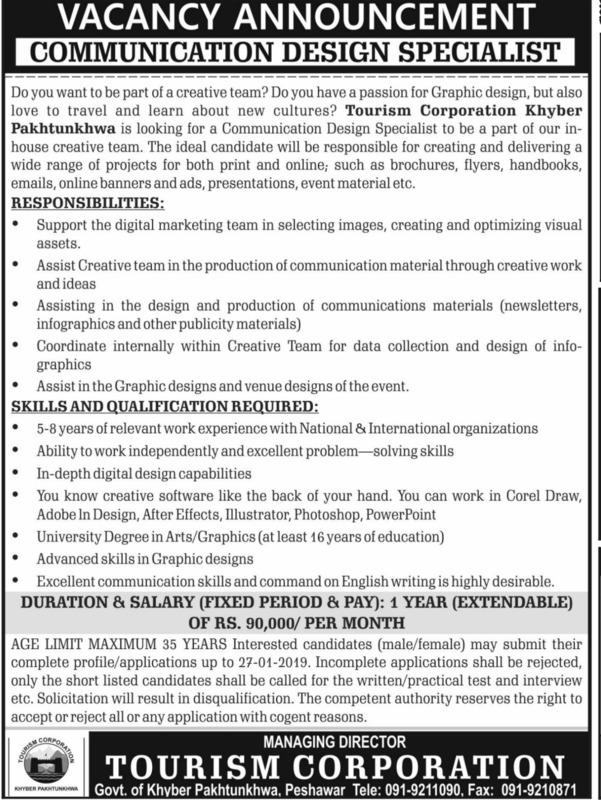 Communication Design Specialist jobs in Tourism Corporation Khyber Pakhtunkhwa Peshawar, in Pakistan published on Paperpk.com from newspaper on January 12,2019. Job seekers who are already working as can also apply for post of Communication Design Specialist.